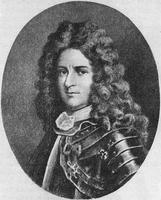 POLLET DE LA COMBE-POCATIÈRE, FRANÇOIS, came to Canada in the summer of 1665 with the headquarters of the Carignan-Salières regiment as a half-pay captain and cavalry sergeant; born probably after 1630 in the small town of Chélieu, in the diocese of Grenoble, son of François Pollet de La Combe, who styled himself Sieur de La Pocatière, and of Catherine Rossin; d. 1672. 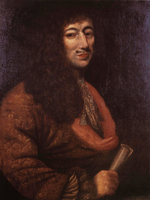 François Pollet de La Combe-Pocatière was a captain on the active list from 1669 until the time of his death on 20 March 1672, four days before the birth of his second daughter. On the following 29 October, his widow received from Intendant Jean Talon the title to the La Pocatière seigneury, “a league and a half along the river by the same distance back,” which she developed slowly, as her resources permitted. The deed of grant required that she should be in residence on her estate, and that, in her contracts with her tenants, she should oblige them to undertake to settle on their lands within a year of the concession. Adding her first name, Anne, to that of the fief, and suppressing her dead husband’s surname, the widow gave to her seigneury the name Sainte-Anne de La Pocatière. By her marriage with François Pollet de La Combe-Pocatière, Marie-Anne Juchereau had two daughters: the elder, Marie-Louise, born 1670, married Augustin Rouer* de Villeray et de La Cardonnière in 1706; the younger, Marie-Thérèse, born 24 March 1672 at Beauport and baptized 27 March at Quebec, married Pierre Le Moyne* d’Iberville at Quebec, 8 Oct. 1693. Marie-Anne Juchereau married again at Quebec on 23 Feb. 1683; her second husband was François-Madeleine-Fortuné Ruette* d’Auteuil, seigneur of Monceaux, and attorney-general in the Conseil Souverain of Quebec. Jug. et délib., I, 776. P.-G. Roy, Inv. concessions, II, III, IV. Régis Roy et Malchelosse, Le régiment de Carignan. Sulte, Mélanges historiques (Malchelosse), VIII. Tanguay, Dictionnaire. Arch. Départementales de l’Isère (Grenoble, France), “Reg. paroissiaux et d’état civil de l’Isère,” Chélieu, 1602–1671: www.archives-isere.fr/1425-archives-en-ligne.htm (consulted 27 Nov. 2014). Bibliothèque et Arch. Nationales du Québec, Centre d’arch. de Québec, CE301-S1, 29 nov. 1669. Gérard Malchelosse, “POLLET DE LA COMBE-POCATIÈRE, FRANÇOIS,” in Dictionary of Canadian Biography, vol. 1, University of Toronto/Université Laval, 2003–, accessed April 20, 2019, http://www.biographi.ca/en/bio/pollet_de_la_combe_pocatiere_francois_1E.html.